It isn’t a secret that our wraps are delicious in taste, various in flavors and GINORMOUS!!! So come enjoy a freshly prepared wrap, like our Thai Chicken Wrap, made with grilled chicken, crispy noodles, bean sprouts, romaine lettuce and mandarin oranges with a tangy honey sesame dressing harmoniously wrapped up in a pesto or sundried tomato tortilla (you choose). Or our Cobb Wrap, everything you would get on a Cobb salad but conveniently combined into a wrap! Write this on your ticket at the end of your meal and get your wrap for HALF the price. 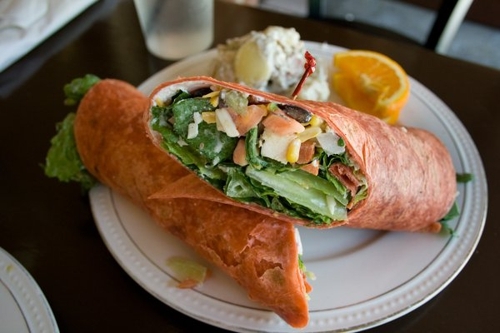 Originally $10, delicious and served with our homemade potato or pesto pasta salad, you can get this tasty and HUGE wrap for $5 (not including sales tax). Enjoy it in our beautiful courtyard, in our A/C cafe or on the go! Only valid for 8/14/ 12 for one time use.